When creating blog content, do you think about the form it takes, or do you just come up with a topic, do a bit of research, and start writing? Not all ideas lend themselves best to a standard blog post. There are lots of ways to format a post, and many of them, when matched with the right type of content, can massively outperform a standard post. The next time you’re gearing up to create blog content, don’t automatically follow the same format you always have. Get out of your comfort zone and ask yourself whether your idea would work better presented in another way. 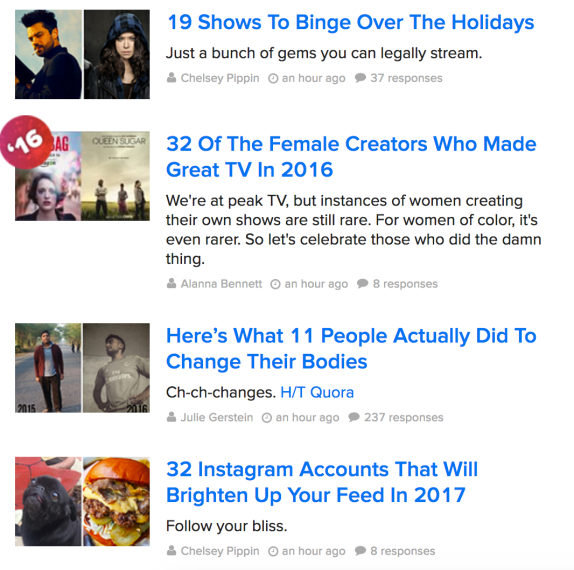 This format is pretty self-explanatory – it’s an article, essentially, but it’s organized into a numbered list. This format is proven to work so well that entire websites have spawned off the back of it – Listverse, and to a large extent, Buzzfeed, are great examples. Would your content suit being broken up into separate points that are linked only by the overriding subject matter? And that subject matter – is it relatively lighthearted? Can you have fun with this topic? Or do you have a series of tips or tactics that you want to share? If so, a numbered list could be ideal. Avoid using numbered lists if you’re trying to tell a story, dealing with a serious subject matter, or writing up an experiment or investigation. Numbered lists are effective because they help our brains process the information. Lists are easier to scan and easier to follow than long-form content organized using paragraphs. We don’t have to stay focused for 3000 words – each point marks a new start for our brain and with it, our focus and memory. Another big plus of the numbered list is the transparency it provides. At any point, the reader is able to understand how far they are into the content, and how much longer it will take to reach the end. If it takes someone a minute to read the first point, they can estimate (although probably subconsciously) that they’ll have read the whole thing in around 10 minutes. If they’re on the fifth point out of ten, they know right away that they’re halfway through. This might not seem important, but we’re living in an age of distraction. We need help to concentrate, and if our focus is drifting, we want to be able to gauge how much longer we’ve got to hold on. Numbered lists make doing that really easy. The infographic is another content format that needs little introduction, but just in case, an infographic is the name given to information presented as a graphic. They are often (but not always) designed vertically, with a 600 pixel width. This is so they can fit snugly inside all blogs. Marketers – or digital marketers, to be precise – love them. Not because they’re a great way to display information and data, but because they’re easy to share, and consequently, a very effective tool for gaining links (or, they are when done right). This Copyblogger infographic on common grammar goofs has been shared more than 265,000 times and has been linked to from a huge range of relevant and high domain authority sites, including Grammar Factory, 9gag, and Scribble Live. 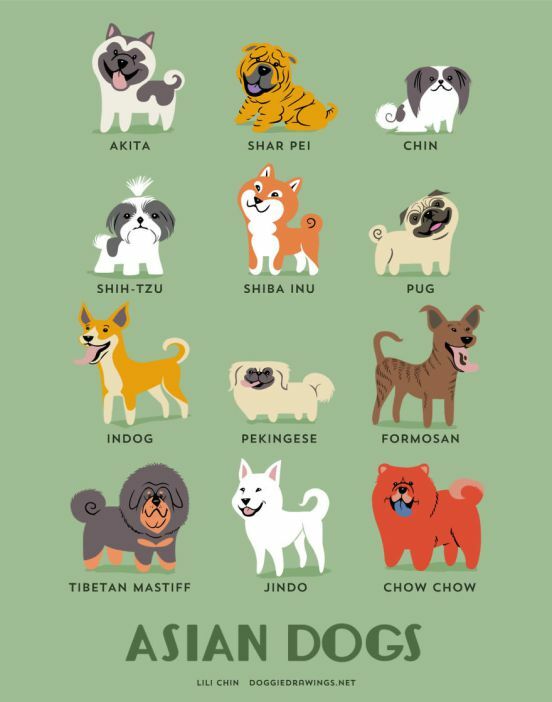 This series of dog images, organized according to the region of the world each dog hails from, is a simple concept executed with style. It’s gained coverage on sites including Gizmodo, Distractify, and Popsugar. A potentially controversial infographic that looks at how low-fat, high-carb diets are making us fat evidently hit the right nerve with some webmasters as it scored tons of coverage. Some more noticeable placements include Born Fitness, Mercola, and Business Insider. Infographics are perfect for displaying data, especially if that data tells a story. They’re also ideal for summarizing and simplifying tricky concepts. Don’t use infographics when you have a lot to say. 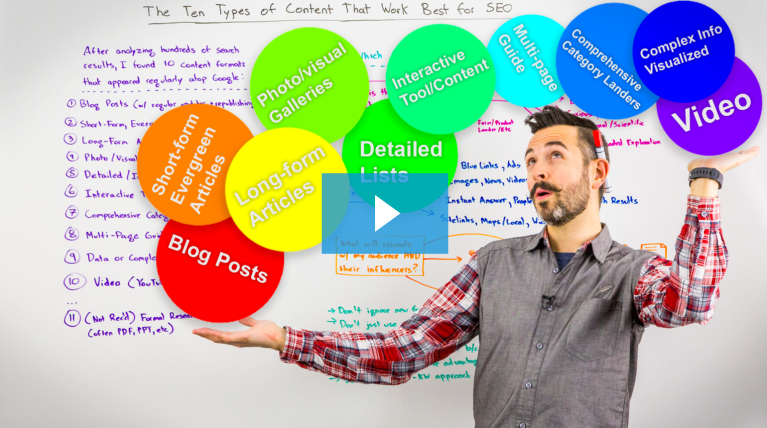 Long-form content should stay that way – usually as a long-form article. Placing the content within the confines of an infographic will make little difference in how enticing it is to visitors and how easy it is to consume. It could even put readers off, especially those who are accustomed to seeing a certain “type” of content displayed in infographic form. Infographics work because they’re visually appealing, easy to share, and, as with the numbered list, they make information really easy to consume. Here’s a case study that details how Brand24 increased its monthly blog traffic by 136%. Here’s another case study that talks about how an e-commerce site increased its search traffic by 1780%. And here’s a look at how a SaaS startup reduced its churn rate by 71%. Case studies are designed to inform, educate, and inspire. Done right, they can also be very entertaining. The case study is perfect if you want to showcase, in detail, the value your product offers. They also work very well when you want to prove a point. Case studies provide very convincing examples of why something works. It’s all in the detail and the presentation. A great case study should have a narrative – it should tell a story – and, as I’m sure you know, our brains really like stories. We’re far more likely to absorb and remember stories than say, a list of bullet points. This is because the narrative gives words meaning. It’s also because – in super-scientific terms – we’re just wired that way. “A story, if broken down into the simplest form, is a connection of cause and effect. And that is exactly how we think. Want to boost the impact of a case study even more? Help your audience relate to your study by covering subjects that will mean something to them and that they can connect with. Slideshows present information using a series of annotated images that the user can scroll through at their own pace. While you’ll often embed them on your site, there’s one site online that’s synonymous with slideshows – so much so that its name is now often used interchangeably with the word “slideshow.” That site is SlideShare. If you’re formatting your content into a slideshow, you’re probably going to want to upload it to SlideShare – it’s a great way to increase visibility. A series of slideshows (9 to be precise) created by Ana Hoffman of Traffic Generation Cafe was viewed 200,000 times over 30 days when uploaded to Slideshare. It also resulted in 400 new Facebook fans and 1400 clicks to her site and Facebook page. Stinson specializes in presentations, so it makes sense that they would use Slideshare to promote the brand. 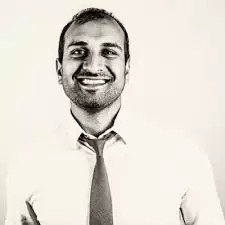 According to Neil Patel, a short slideshow it produced, titled 12 Things Jay-Z Has Taught Us About Style, has been an effective lead-generation tool (and it’s been viewed more than 5000 times). Like infographics, slideshows work best when you have information that is easily summarized. They lend themselves very well to how-tos. 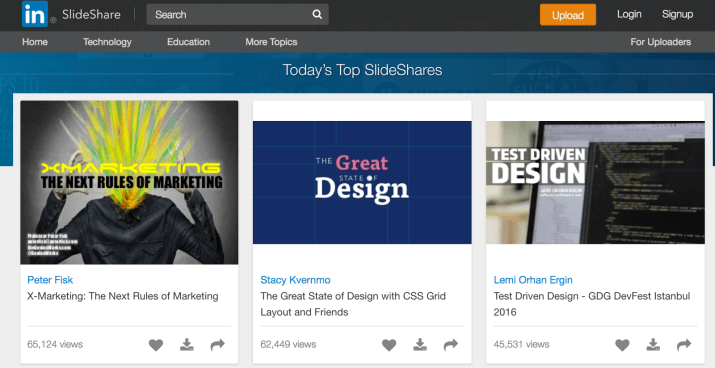 SlideShare itself is a great platform for getting extra leverage out of presentations. Most of us spend ages prepping slides before a big presentation, so it makes sense to reuse them if we can. SlideShare lets you do that. People like slideshows because they provide information in a bite-sized format. Slides tend to be image-heavy with only a few words to read, which makes them easy and fun to consume. Primary or “first-hand” research is new research that’s being presented by the very people that carried it out. Research that’s published as part of a journal. Research distributed online – either hidden behind a paywall or available freely on a website. Research that’s shared as part of a blog post. To expand the context, secondary research is when that primary research is used as part of a separate project. If you used someone else’s research in an infographic, for example, that would be secondary research. It seems that many more B2B than B2C brands carry out and leverage primary research, but that doesn’t mean the tactic can’t be just as effective for B2C. Each year, Moz releases a Search Engine Ranking Factors report, which results from a survey it distributes to over 150 trusted professionals in the industry. 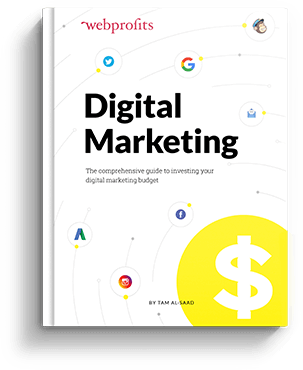 You’re probably also familiar with the Content Marketing Institute’s Content Marketing Budgets, Benchmarks and Trends report. Stats from the report are quoted by other marketers all the time. I don’t doubt it played a huge part in putting CMI on the map. If the goal of your content is to gain coverage and links, carrying out primary research is a great way to do it. It’s also perfect when you have a theory, but can’t find the data to back your theory up. If that data doesn’t already exist, make it exist. Last but not least, primary research can help give other forms of content a “hook” – something that attracts publishers, and in turn, an audience. Often, all it takes to get that hook is a single statistic – a single piece of primary research. Google Surveys can help you with this. This is a great high-performing format because you’re bringing something new and original to the table: information that has never existed before, that adds to or changes the conversation, and that other marketers can potentially leverage in their own content. Video as a concept doesn’t need an introduction, but its use in blog posts might. You might think of YouTube as the Holy Grail of online video, and you’d probably be right. However, while it’s always a good idea to boost your reach by uploading your videos to YouTube, embedding them into blog posts is a great way to leverage this format, too. I can’t think of any better example of this strategy in action than Moz’s Whiteboard Friday videos. Each post’s main attraction is the video, but for search engines and users who would just prefer to read, a transcription of the video is included, too. When you have ideas, information, or a story that you can tell succinctly in a few minutes, video is ideal. That’s because in online video, brevity is key. Exactly how long should an online video be? There are no hard-and-fast rules, but play it safe and keep it under five minutes (sure, the Whiteboard Friday videos are longer, but they already have a loyal following that is accustomed to Moz’s format). Video helps you connect with your audience in a way that’s impossible with text – no matter what you do to personalize it, or however great a story you may tell. Video is something I’ve been doing a lot more of lately (you can check out my YouTube channel here). The number of viewers I get pales in comparison to what I get on my blog, but engagement is through the roof. I’m pretty certain that’s because of the way the format allows my audience to connect with me and the relationships it helps me to build. A podcast is a digital audio file that can be streamed for instant listening or downloaded so it can be listened to later, even if the listener’s offline. They often form part of a series, and the content itself tends to be somewhat similar to what you might expect to see in a blog post. They commonly adopt a pretty casual tone and style, that while informative, is really accessible, too. As with video, you can incorporate a podcast into a blog post and include a transcription alongside it. You can also upload them to sites like Soundcloud. Scott Britton hosts a podcast called The Competitive Edge. 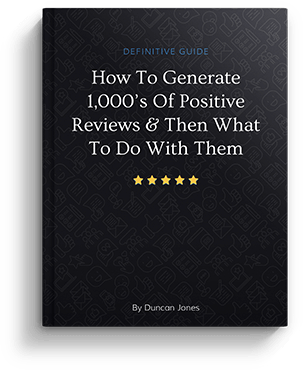 Within 8 weeks of launch, he gained 2,321 new email subscribers and saw a noticeable increase in purchases of products from his site. 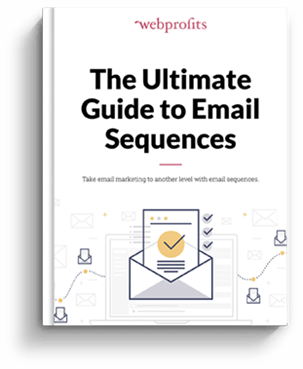 When Social Triggers’ Derek Halpern launched a podcast, he gained 2,281 email subscribers and increased traffic to his blog by 69% – all in just 27 days. When you want to communicate similar information to what you might include in a blog post, use a format that helps you build a deeper connection with your audience. One, like video, podcasts help you connect with your audience in a way you can’t through text. Two, they allow you to reach people at times and in places that text and video just can’t – while they’re driving, for example, or otherwise unable to watch a video or read an article. Oh, and while we’re on that point – this also means that it’s easier to keep your audience engaged for much longer. After all, if you’re driving, the sensible thing to do is to sit tight, and listen until the end. Before we wrap up, I want to touch on one final point. We’ve been talking about different formats your blog posts could potentially take for greater impact. However, while you should always try to match a subject and format the best you can, don’t forget that many forms of content can be repurposed. An infographic could become a blog post. A blog post could become a podcast. A bullet point list could become an infographic. An infographic could become a slide show. Repurposing content helps you get more bang for your buck. Usually you have to come up with an idea, a draft, and produce a piece of content from scratch. With repurposing, all you have to do is take your existing piece of content, alter it as necessary, and recreate it in a different format.